When I made the transition from suburb to city, I moved into the middle of a mess. Not a day goes by that I don't encounter a homeless person on the streets. It's a good day if I only see one. Seeing them has elicited a range of emotions: sympathy and frustration on my more compassionate days, annoyance and fear on my more cynical ones. I walk daily not only to and from the office, but around the neighborhood at lunchtime with my colleagues for exercise. Generally we smile and say "sorry" and move along. Occasionally I'll have a granola bar to offer him. One coworker even admitted that while she loves the job, she hates these messy encounters that come with it. I couldn't disagree. One walk went a little differently than others. A colleague opted to join us, and when seeing the man, approached him, began a conversation, and said "sorry I've got nothing me today, I'll get you next time." The rest of us stood, waiting uncomfortably for this transaction to end. A sense of guilt nagged at me. Sure, I'd shared food on occasion, but I'd never bothered to say hi, learn his name, or hear his story. My colleague had entered the mess while I had picked up one piece of litter and moved on. I was sent a copy of Move Toward the Mess by John Hambrick, and while I dreaded reading it as I knew even more guilt would ensue, I was engaged from the first paragraph. 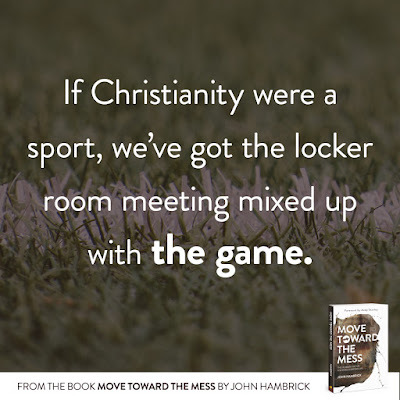 Hambrick argues that Christians are bored because we've "got the locker room meeting mixed up with the game." If we think our faith is just weekly church services, of course our spiritual lives will be dull. However, if we take a leap of faith into the messes around us and get to work, our boredom is certain to evaporate. The stories illustrating Hambrick's argument are engaging and diverse, from a couple showing love to prostitutes in Atlanta to a reformed IRA bomber. 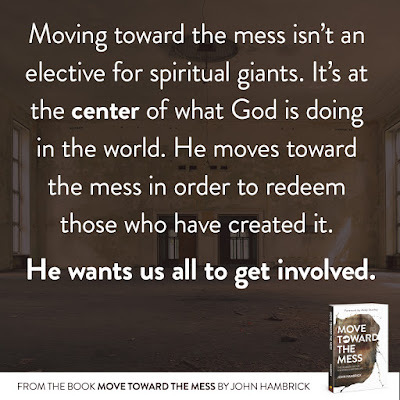 The book reads faster than expected, and unlike many books of this genre, Move Toward the Mess offers clear guidance of ways you can move toward and get involved in the mess (or, just as likely, accept the mess that finds you). 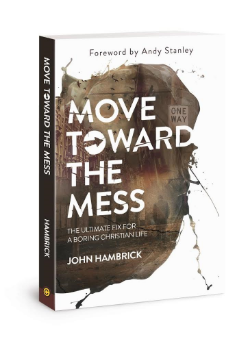 I don't think Hambrick exaggerates at all when he calls his book "The Ultimate Fix for a Boring Christian Life." 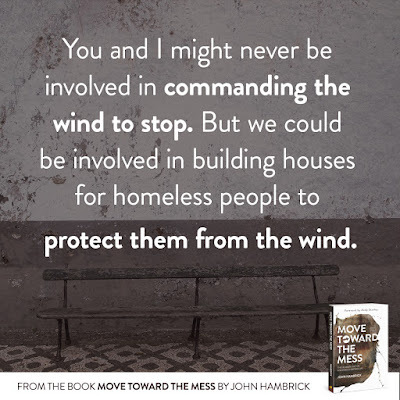 I am giving a copy of Move Toward the Mess away courtesy of BlogAbout. Enter below! 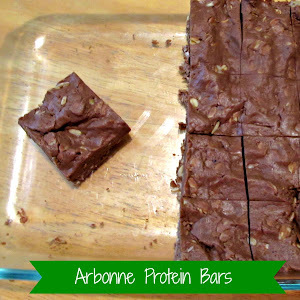 When I was younger and healthier, I considered and wanted to help in so many ways! I even wanted to be a nun so I can concentrate on others instead of myself! But then, I got caught up in this rat race called life! Had a few messes of my own, but God was always there for me! I THANK Him so much!! I'd love to read this book and share it!! These are the last days and we better do more than clean up messes! We've got to get our lives & souls together to meet other Our Heavenly Father!! I accidentally clicked the submit button before I wrote out my last name in the comment field of the Gleam form! It should say Sue Emery commented- not Sue E! SORRY!! I volunteer at church to try to help kids stay out of the "messes" in the world. The thing that comes to mind is my intention of actively listening to someone when they're speaking. We all have a need to be really heard and understood. That always helps! If you don't really "hear" what someone is saying, you don't truly know what they need. No, not really. 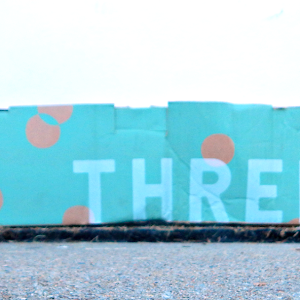 I tend to stick to myself. Yes. 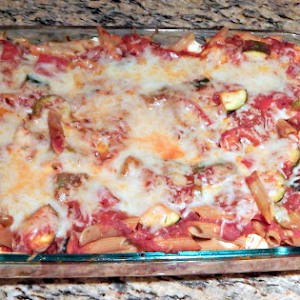 We were foster parents, then adoptive parents, then moved. 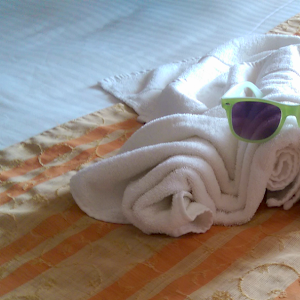 Not sure if we will do it again. At times I wish we could do/did more. Other times I feel as if living it every day takes too much toll on our emotions/health or holds too much risk. I wish others would help, yet feel hesitant to ask them to go through even a little of what we have (and that isn't even an iota as bad as it sometimes gets). I think perhaps I would like to work on the fore-end, helping prevent families from getting here; though I know from experience that the receiver has to want it as well. Wow, thank you for sharing this! I've always had an interest in fostering children, but haven't taken the jump into that "mess" yet. I try to help out the community as much as possible to set an example for my children. i give recreational equipment to the prisons near here. I also send greeting cards for them to mail to their families. Yes I have an empathetic heart and wish I could help in so many ways. I'm often reminded that by being there for someone we are doing much often times. Yes I see them, but I have found, I have to start stepping away, always getting burned. I am active with my church in trying to help at-risk youth. It's very rewarding to see how some have turned their lives around. But I see so many people in our area who are homeless or hungry, and hopeless/ That is the mess I want to work toward cleaning up. Yes, until I became disabled I worked with young single Mothers. My granddaughter would like to help the homeless. Thanks! Yes but I try to stay away from it.. I will not get involved in messes! I've volunteered for numerous places. Unfortunately, there are to many "messes" around. But also beautiful things and good people. We must never forget!